Featuring sparkling cubic zirconia, these glamorous 9ct white gold drop earrings are designed to add a touch of vintage luxury to your outfit, whatever the occasion. 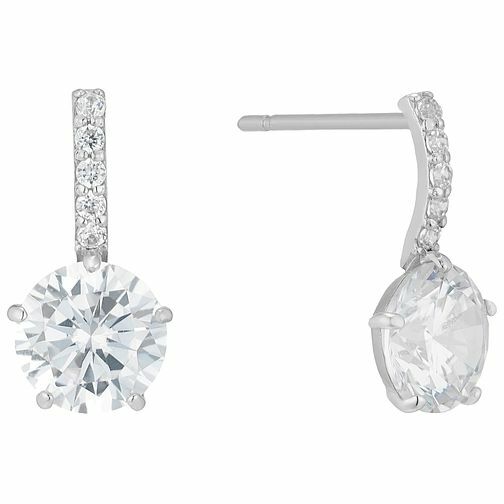 9ct White Gold Cubic Zirconia Solitaire Drop Earrings is rated 1.0 out of 5 by 1. Rated 1 out of 5 by Anonymous from stones fall out I bought these along with a matching nevklace for my wedding, on the day of my wedding stones on the earrings fell out, I brought them back to the shop and was given a new pair only for it to happen again. Very disappointed as now have no earrings from my wedding day :( also the necklace has luckily been ok, don't know why the earrings are such poor quality.